Light + Love : Scary FB Experience. The cookies worth stealing from the cookie jar. 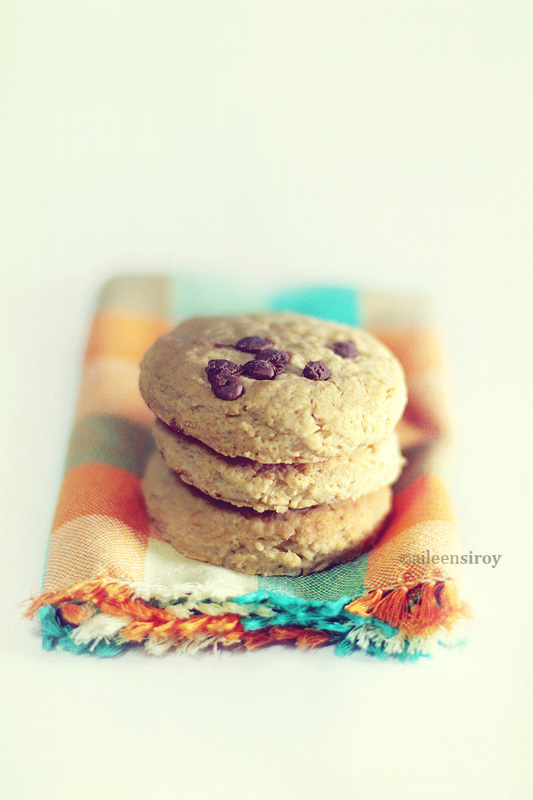 Chocolate chip oatmeal cookies from Sonya's Garden. Imagine this on the right side of your FB homepage -- your picture smiling back at you with the words: Add (your name) as a friend. You'd be shocked, and perhaps, confused, wouldn't you? I almost had a cardiac arrest when this happened to me tonight. I was happily munching oatmeal cookies when I saw it. Someone opened an FB account and used my name and picture. I felt angry, at least for a minute or two. I felt like someone just stole my identity. I had to take deep breaths and decided I will not get angry. Getting angry will not solve anything. Instead, I reported it to FB and posted a shoutout to my friends that there's someone out there assuming my identity. I don't get it. Who wants to be me? I'm not an artista and is nowhere near celebrityhood. I thought this only happens to famous people. So what's this person's intention? I hope s/he is doing this out of utter liking and not because of deep hatred for me. So far, this person hasn't maligned my name yet, which is a good thing. I live a simple, quiet life. I know that there will always be people who will not like me. But that's part of life. Or maybe, that person is just bored and randomly picked me to annoy? I don't know. Over at FB, I am very picky about who I accept as friends. I even ignore invitations from classmates who were not really close to me. I ignore invitations from people I do not have any meaningful connections with. Because really, what's the point? I am very grateful because I have old and new friends who reported the incident to FB. I have friends who got my back. I hope they know I'd do the same if this ever happened to them. Tonight, I feel very blessed. And grateful. And please, be careful out there. Someone could be using your identities/profiles, too. It's actually very scary how easy it is for people to do that -- steal your photos and make fake profiles. Photo: I'm not a cookie person but those oatmeal cookies from Sonya's are really good. Not too sweet, not too chewy, not too dry. Just perfect. Thank you CBB for this pasalubong. take care out there. we should all be careful. LOL! Bitaw, Chi! Maybe that person thinks s/he is my twin! Seriously, I hope so, too, that this does not happen to anyone else. oh ai, i feel so sorry for you..i can imagine your heart must have shook when you saw your own face inviting you to be friends with yourself..
As i had left a comment in your FB acct ai, truly scary... The good thing is you caught it. Let's all be careful. Nagkatawa ko sa: "your own face inviting you to be friends with yourself." But it's also scary. How easy it is for people to do that. Thanks for the comforting words, Chel. I don't think that person won't survive if she she'd be in my shoes. :D Still, I hope FB will delete that profile soon. Thank you, Chel, for always being there. I'm feeling better, although sometimes, mapungot gihapon ko sa thought. Thanks, Chel. Hugs back! Be careful out there. They could be hackers or someone out there to invade your privacy. Yep, I got your invite for Damita's page. Thanks, Tita Lou! It's scary. We should all really be careful, especially over at FB. Hala uy, scary. I agree with you 100%, Ai... na daghang yabag sa FB, that's why I kept my other personal details na. So am I friends with the real Aileen Siroy then? ;-) *Joke* I think I am! I bet the fake account does not have the most amazing photos. Seriously, thanks for not ignoring me! Big fan intawn ko nimo, Ai!